W każdym razie wróciła mi miłość do 'National Anthem' of USA, jak to nam śpiewała Lana del Rey. Jeśli jakiś element naszego outfitu jest bardzo krzykliwy, jak w tym przypadku legginsy, to powinniśmy dobrać do tego jednolitą i tonująca resztę. W tym przypadku postawiłam na koszulę z cieniutkiego jeansu. Taka koszula to absolutny MUST HAVE. Ja poluję na wyprzedażach na taką bez rękawów, z ćwiekami (ewentualnie sama je doszyję) i z jaśniejszego jeansu. Obecnie mam tylko taką, a wygrzebałam ją (nie wiem jakim cudem!) z pudeł zakopanych na strychu! Niesamowite co można czasami znaleźć w swoim domu ;). Some time ago we all fell in love with national flag of USA. They were everywhere - on Tshirts, bags, pants or swings. When popular shops made some clothes with it I saw girls in flag-outfits everywhere - in school, on the street. 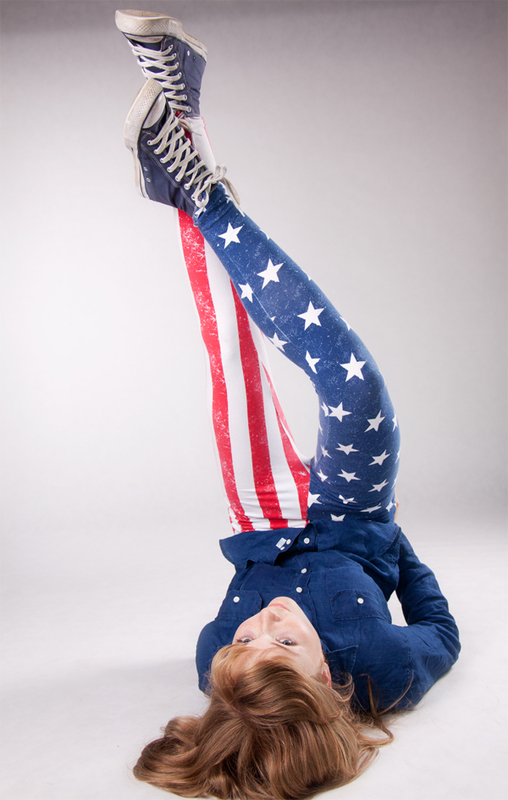 I bought mine USA leggins half year ago and honestly I completly forgot about it. I've recalled about it yesterday, because of terrible, windy weather. However, I fell in love with 'Nathional Anthem' , as Lana del Rey sang, again. When we wear something flashy we have to connect it with plain clothes. This time I wore it with jeans shirt, which I found somewhere in box in my loft. It was such a suprise for me! We can find so many useful things in our houses! Jeans shirt is one of the biggest MUST HAVES. I'm looking for a brighter, sleevless one. I think I will also so something with that shirt, because I've found two of them and I can put brads or lace on it. mozesz mi powiedziec czemu akurat skomentowalas tamten post? Thank you. If you want to of course! Love the leggings. Funny how a flag can become such a fashion statement! Your photos also look so professional- so cool! Thanks, yeah it's funny but I think that also stylish! Hi Karolina, Thanks you for your comment in my blog. I will write also in english again, so it's easier for all of you lovely readers. :) You have great photos too! Amazing. :) Follow each other? Masz świetną urodę ; ) Dzięki za odwiedzenie naszego bloga, dodaję do obserwowanych, bo naprawdę warto! Thanks for your comment. Honestly they're too popular right now.. Thank you for your comment. Now I follow your blog. legginy wymiatają ...koszula tez świetna ! your American tights are amazing!!!! Love so much! amazing outfit! Followed you on bloglovin, maybe follow me back? Karolina thanks for visiting my blog, yours is really nice! Im now following you :) Hope you can come back to mine!!!! Lovely pics! ;) What about follow each other? I really like your blog Carolina! Yous leggings are amazing! You can check my blog and follow each other on bloglovin so we can keep up!